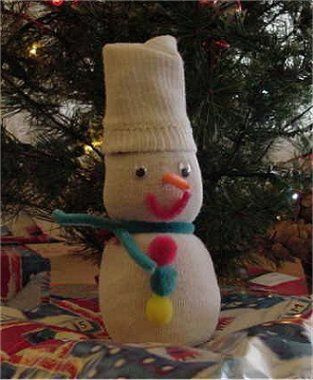 Find out how to make a snowman out of a sock, submitted by H. Marie. An easy project with fantastic results! You'll love how fun these are to make with your kids. They'll love to play with this darling snowman when it's complete. Fill the sock about 2/3 full with rice. Use the yarn and tie the sock closed about 1-inch above the rice. Divide the rice filled section of the sock almost in half. You will want the section closest to the top to be a bit smaller. This will be the snowman's head. Tie a piece of yarn tightly around the sock where you divided into 2 sections. Roll or fold down the top, empty half of the sock so it looks like a hat. Now, you can use a variety of craft supplies to decorate your snowman! You can glue a large pom-pom on the top of the hat. Use a piece of felt or scrap fabric and cut out a scarf shape. You can give him eyes, a carrot nose (chenille stems or felt works well), mouth, buttons, etc. Use wiggle eyes, beads, smaller pom-poms, buttons, scrap felt, or anything else you have on hand.